Take Unitarian Universalism with you everywhere. Silver plated. 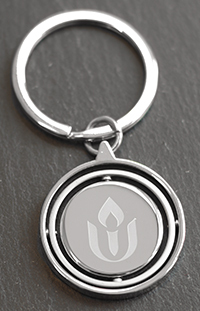 An elegant way to proclaim your faith. Gold -plated double circle chalice pendant available in 2 sizes. Double Circle Gold-Plated Chalice Pendant - 1"
Double Circle Gold-Plated Chalice Pendant - 3/4"
Pewter double circle chalice pendant available in 2 sizes. Double Circle Pewter Chalice Pendant - 3/4"
Double Circle Pewter Chalice Pendant - 1"
Make a statement with this chic, embossed necklace—featuring an exclusive flame design.